ITEM: MY LITTLE PONY TWILIGHT SPARKLES DOLL. WE WILL WORK TO RESOLVE ANY ISSUES YOU HAVE. 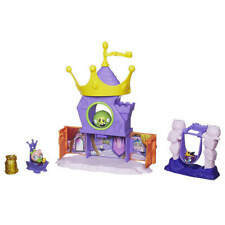 Join them as you try to knock that pesky piggy off his perch and win back the palace. Includes right spin Energy layer, D01L Forge Disc, and TA06L Performance Tip. Valtryek V2 Attack Type. Play virtually with the Beyblade Burst app! 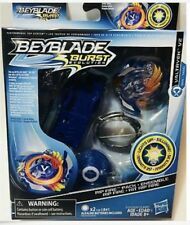 New Hasbro Beyblade Legends BB-59 Burn Fireblaze 135MS. 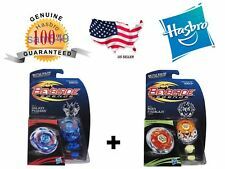 New Hasbro Legends Beyblade BB-70 Galaxy Pegasus W105R2F. Includes 5-piece Legends top, Ripcord Launcher, collector card, assembly instructions and tool. FIREFUSE DARKHELM top’s Defense Spike PERFORMANCE TIP is designed to maximize defense and stamina. New 2018 Hasbro Beyblade Burst Evolution SwitchStrike Green Fafnir F3 DR34/TS01 Starter Pack. New Hasbro Beyblade Burst Ifritor I2. Starter Pack. I have 3 types of cases currently. Choose which 3 cases you want. This is very important. Most collectors like to have sealed cases if possible. First blader to reach 3 points wins. Here is a collector/dealers dream. Can "burst" into pieces (burst rates vary). First blader to reach 3 points wins. Scan code on Beyblade Burst SwitchStrike top Energy Layer to unleash the top and mix and match with other components in the Beyblade Burst app. Includes: Chamber Challenge Vault and 5 Power Tokens. Top can "burst" into pieces, resulting in 2 points for the player left standing (Burst rates vary). First player to earn 3 points wins! Collect, customize, and compete. Play in the app with these creations. And Pirate Orochi 145D For Stamina. Pirate Orochi Top Has A Tough Defense Performance Tip Part. Hasbro Beyblade Shogun Steel. Pirate Orochi/Guardian Leviathan. Features Guardian Leviathan A230JSB For Defense. Shoeshine (crystal). Blind bag wave 4, bag #23. For sale is one Obi-Wan Kenobi Force Action Lightsaber toy. I have many other Lightsabers for sale right now, as well as other Star Wars toys! Subject to availability. Includes Beyblade Burst: Energy Layer (1), Forge Disc (1), Performance Tip (1), launcher (1), and instructions. My Little Pony Equestria Girls Extra Long Hair Rainbow Dash 9" Doll & Accessories. Equestria Girls. My Little Pony. Rainbow Dash 9" Doll & Accessories. Includes: Doll, Brush, 3 Clip on Hair Extensions, 6 Barrett's. LOTS of styles for children and adults! Very good condition, nothing broken. Sold as is. Used Condition. Coins are showing wear and discoloration as is condition. Everything shown in the pictures comes with this set. More pictures upon request just ask! Have an epic battle with the new Burst series beys from Hasbro! • Hasbro Authentic product. 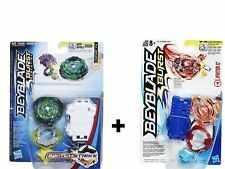 • Beyblade Burst SwitchStrike Legend Spryzen S3 D30 TB06 right/left spin top. Hasbro COPS N' CROOKS DRAGSTER C.O.P.S. 1989 89 Star Comics Series 2. Condition is New. Shipped with USPS Priority Mail. • Dark color version with stamina flugel driver and spring layer. Have an epic battle with the new Burst series beys from Hasbro! • Compatible with Burst series beys and launchers only. • Hasbro authentic. I think everyone knows the great detail that 4DE put into their ponies, including series accurate double-sided CUTIE MARKS, embroidered eyes (not STICKERS like lesser pony plush) and the ability to be "FREE STANDING", no 'prop' or 'doll stand' needed! The My Little Pony Equestria Girls Minis School Dance Flash Sentry doll is ready to rock and fun to pose! Pretend to play for a cheering crowd with this mini dolls articulated arms and legs and the guitar accessory. For sale are two 2009 Obi-Wan Kenobi Lightsaber toys. No batteries included for either Lightsaber, each requires 3x AAA. I have many Lightsabers and other Star Wars toys for sale currently. Real Bakushin Susanow (Susanoo) Metal Takara / Hasbro Beyblade - USA SELLER! Have an epic battle with this rare bey Bakushin Susanow 90WF (wide Flat tip). 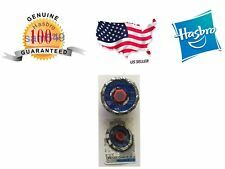 • Hasbro Authentic beyblade! • Decals included. • Special color version. This has a bend or a roll forward at top as can be seen in close-up photos. Item in the photos is the item you will receive. BeyBlade Stunt Stadium. Model: Pegasus. This is a must-have for any Pokémon collector. This is new in box and ready to be played with. Item is new and sealed. No broken seals. Just top notch quality and service at no extra cost! WILD MANE LEONE. W-05 Power. Ride the rails with Beyblade Burst Slingshock tech! Bladers can keep the Performance Tip in Battle Ring Mode to defend their position in the Beystadium, or convert it to Slingshock Mode to ride the rails and amp up the battle. Equestria Girls Minis. School Cafeteria Set. My Little Pony.